Unique Thank You In-law Gift on Wedding Day! You are about to marry their son or daughter and you want to thank them for all they have done and tell them how much you are looking forward to being a part of their family. This poem for inlaws says it beautifully. 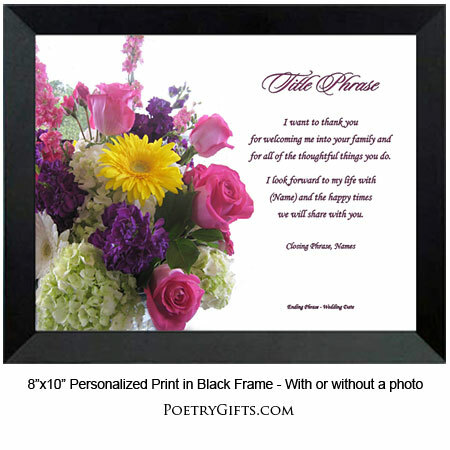 Personalize the poem with names, wedding date and a heartfelt message from you and it is sure to touch the hearts of your future inlaws. Order it with a cut-out photo area where they can easily insert one of your wedding photos and you will be giving them a lasting keepsake. You are getting married and becoming part of your spouse's family. It's an exciting time and you are looking forward to many fun family celebrations. 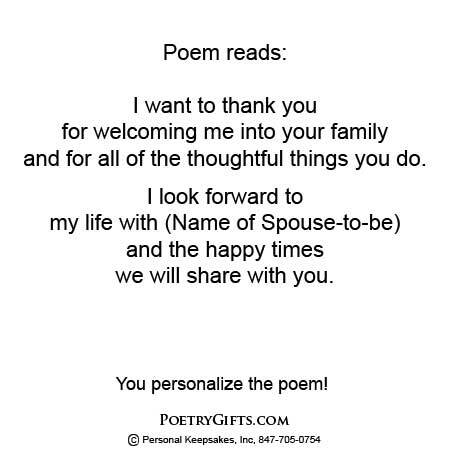 Why not give this Poetry Gift for Inlaws as a way of thanking your mother-in-law and/or father-in-law for welcoming you into their family. 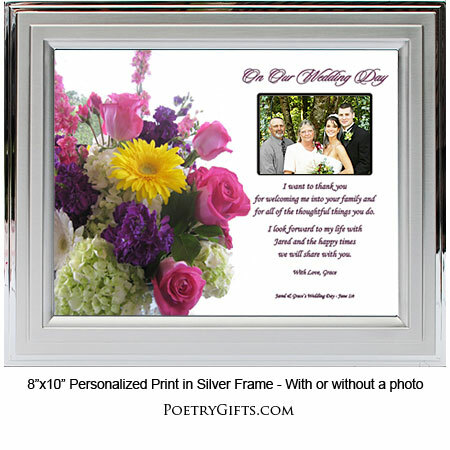 Answer the personalization questions above and you are on your way to creating a thoughtful, meaningful, and lasting keepsake for your mom & dad in-law. 3. Closing Phrase and Your Name (as seen after poem) - (Examples: With Love, Amy; With Appreciation, Joe; etc.)" 4. 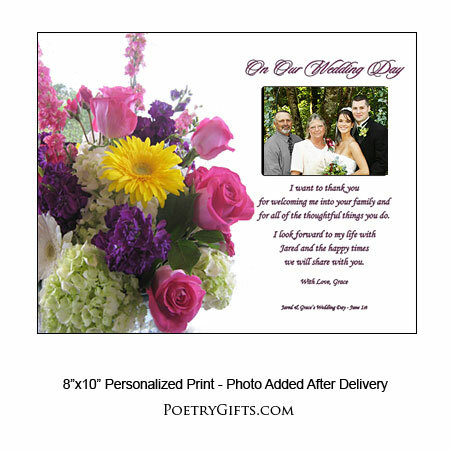 Optional Phrase and Wedding Date - (Example: Amy & Ken's Wedding Day - June 15; Joe & Sarah's Wedding Day; October 5; etc.)"